Defending Pro12 champions Glasgow Warriors claimed their first win of the season after surviving a determined fightback from Connacht. Tries by Glenn Bryce and Scott Cummings helped Glasgow build up a 23-6 advantage at the break. A penalty try and scores by Danie Poolman and Nepia Fox-Matamua gave Glasgow more concern but they held on. Connacht leave Scotstoun with a losing bonus point to add to the four they picked up last week against Newport Gwent Dragons. The scoreline reflected a fairly mixed performance from the Warriors in their second successive home match, having lost by six points to Scarlets last week. They started sluggishly and, for a brief moment, Connacht thought they had scored the opening try in fairly bizarre circumstances. Junior Bulumakau retrieved the ball after it had gone into touch and threw it towards a team-mate in preparation for a line-out. But Poolman intercepted as the ball came back on to the field and touched down. Referee Ian Davies consulted the TMO and the officials deemed that Bulumakau's throw was not intended as a line-out. Jack Carty and Rory Clegg exchanged penalties before Gregor Townsend's side began to find their rhythm and Clegg added two more successful kicks. A sustained period of phases eventually yielded the opening try as Bryce burst through from deep off Clegg's pass and the full-back's pace took him past the Connacht defence. Clegg's conversion hit the post on its way through. 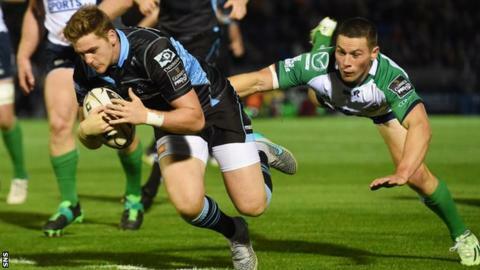 Mike Blair, making his first competitive start for Glasgow, off-loaded from a scrum very near the line for 18-year-old Cummings to bustle his way over and Clegg again added the extras. Carty kicked another penalty just before the turnaround but that offered only temporary respite for the Irish province as Glasgow capitalised on an error right at the start of the second period. Scrum-half Cooney slipped as he attempted a kick following a line-out and Harley took full advantage by cantering over unchallenged. However, Cooney quickly atoned for his mistake when he received Eoghan Masterson's pass and ran in Connacht's first try. Carty converted. The momentum was now with the visitors and, after several warnings to the players by Davies, Glasgow replacement prop Zander Fagerson was sin-binned for early engagement. Connacht then got their penalty try and Carty added the conversion. The pressure on the depleted hosts continued and a superb grubber kick by Rory Parata sent Poolman on his way for the score. However, on this occasion Carty could not convert, leaving them five points behind. Glasgow knew they needed to stem the flow of attacks and managed to temporarily re-gain the initiative. Though the TMO ruled that Adam Ashe had not scored a fourth Glasgow try after being crowded out on the line, another penalty by Clegg opened up a more comfortable gap. But Fox-Matamua's touchdown from a maul and Carty's conversion made for a frantic last few minutes and Glasgow were relieved when a Connacht knock-on brought proceedings to a halt. Glasgow: G. Bryce, Bulumakau, Murchie, Lyle, Jones, Clegg, Blair, Allan, MacArthur, Cusack, Cummings, Low, Harley, Fusaro, Ashe. Replacements: Wight for Bulumakau (41), Blake for Murchie (15), Hart for Blair (67), K. Bryce for MacArthur (49), Yanuyanutawa for Allan (49), Fagerson for Cusack (49), Holmes for Fusaro (52), Eddie for Cusack (67). Sin Bin: Fagerson (57). Connacht: O'Halloran, Poolman, Parata, Aki, Carr, Carty, J. Cooney, Buckley, McCartney, Ah You, Roux, Browne, Muldoon, Fox-Matamua, Masteron. Replacements: Marmion for J. Cooney (49), Marshall for Roux (50), Bealham for Ah You (65), Dillane for Browne (66), J. Cooney for Buckley (69), O'Leary for Parata (73), Heffernan for McCartney (77), Ronaldson for O'Halloran (78).